I’ve had some mommy moments these last few weeks. 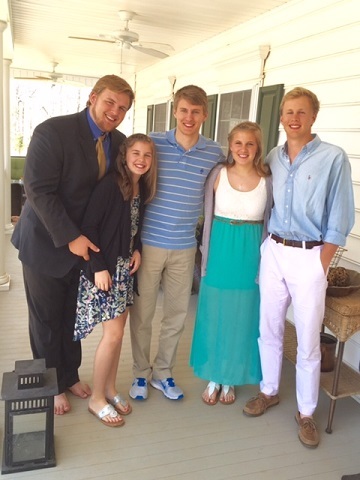 This summer, I only have three weeks when my “babies” will all together and last week was one of them. I can’t even tell you how wonderful it was, but I realize just how much I miss my big guys when they’re gone. They bring such life to the home. As a parent, you prepare a long time for that moment when you launch them into adulthood, but it doesn’t make it any easier. I just love being with them and celebrate the amazing men they’re becoming. It truly hit home just how rare our priceless “all together under the same roof” moments are these days. I can hardly believe our eldest son is entering his last year of college. (Did you read about his crazy “I just can’t make this stuff up” summer last year? Don’t worry this summer’s internship will be a “tad” different. It better be.) Our second son is a rising college sophomore and due to his football scholarship, he must be at school most of the summer, and over the next two years, we’ll have two more kids heading off to school. If you are a parent of little ones, it’s hard to fathom that moment, but this post is exactly for you because it’s never to early to start thinking about it. Last year, I shared 5 Ways to Save and Pay Cash for College, but I admit, with each additional child we’re adding on, it’s getting more challenging. In sticking to our “every child pays half of their college costs” conviction, our third son will have some challenges in heading to the college of his choice. Since we won’t co-sign on a loan for him, he’s realizing he has some big decisions ahead. We have been telling him it’s never too late to save for college, and I share that sentiment with every single parent reading – it’s not too late (or too early). In 2014, less than half of parents were saving for college and each year, that number drops. Don’t get discouraged! Know that every little bit makes a difference and there are more and more creative ways to achieve higher level learning without a huge price tag. Since we desire for our children to be debt free, we encourage them to save more like 80%, but just like adults, each child is quite different in the saving/spending category. Can you relate? If they are going to work hard saving, I want them to have something to show for it. Recently, I was introduced to ECCU (Evangelical Christian Credit Union). I wasn’t aware just how unique their services are in comparison to my traditional bank, which I’ve had numerous problems with recently. As I compare ECCU to my bank, there are fewer fees, much higher savings rates and built in perks. Not only that, but they invest profits in social causes and enable churches and ministries to receive low cost banking services. They give back! I love that! I’ve looked into a few options on how to allow our money to work smarter. High yield promotional certificates with guaranteed rates are good for saving money that you do not need to access for several years down the road. When you feel like you don’t know where to start, consider a few strategies my husband and I have implemented through the years. Use auto-deposit services. I have a few small paychecks deposited magically in my savings account every month. I love it because I have those set to deposit (and forget). Be proactive and set aside a consistent amount from each paycheck. Even if it’s just $5, start with something immediately. Commit to saving a portion of your tax refund or company bonus each year. Anytime you receive an unexpected amount, commit those to your savings account. Keep a cup on your dresser and gather all your loose change throughout the year. It’s amazing how it adds up. Those are just a few of my thoughts as we stumble through this ourselves and I’d love to hear yours as well. I’m just beginning to touch the surface of this topic. This giveaway post was brought to you by ECCU. All convictions about paying for college and ideas on savings are entirely my own. Many states offer 529 savings plans for college as well. I think that an automatic deposit from your paycheck every pay cycle is the best way to save for college. It’s surprising how quickly money can accumulate that way. Thank you for this post. Especially stating that it is never to late to start saving for college. Our two daughters chose to be Freshman Resident Advisers after completing their freshman year. They worked for the University housing department, and received Room & Board and a small stipend. It was hard work, but they enjoyed mentoring freshmen. They ended up with many lifelong friendships (and have been in quite a few weddings as a result). They were still able to have summer internships in their field, but they say their RA experience was one of the best preparations for the Real World Workplace. Our son chose to Co-operative Education program, where he works one semester and goes to school one semester. While this does lengthen the time it takes to graduate, most co-op students are able to command a higher starting salary since they have a year or more of industry experience. @Susie E, I love hearing your kids experiences. Such wise decisions they made! 🙂 Thanks for sharing. Thanks so much for the advice. We are working hard to look for college savings, and making it clear that our children need to contribute! We’ve been saving since our daughter was born, but it’s been a bit on and off recently due to unemployment – gotta pay the mortgage! This is a great reminder to get a regular bill pay set up for the college savings fun. @Lindsay James, oh Lindsay – I SO know the unemployment woes and unfortunately, we had to empty our college savings once in a critical time. Bottom line on that? I was SO SO grateful that we had that to dip into at the time. If you do find yourself with loans for your kids college costs, try and pay more than the minimum payment each month. It can make such a difference in the number of years you pay the loans back and the amount of interest you pay. You can set it up automatically for a set amount or do it manually every pay day. I have a budget every week and if there is money left at the end of the week I put it towards the college loans. We have always lived frugally and were lucky to have our house paid off before the college loans hit. If you have young children ,and can prepare now, that is a great idea. @Tracy L, CONGRATS ON NO MORTGAGE!! That is AMAZING and I can’t even imagine what an amazing feeling when you paid that final note. Great idea on paying more than the minimum. That slashes a lot of that interest. Thanks for sharing, I have two years until my oldest is in college. Our 1st son heads to college this year…we are having him pay for 1/2 and thankfully we are in a better financial position this past few years so we can provide 1/2…but it is expensive and his school gave very few scholarships and b/c he isn’t an athlete it is even harder. But I have always appreciated your tips and when we had a financial windfall last year we put away our 1/2 for the next 2 years in a special account…so we know it is there. Praise God for that! Now that my son is heading off to college in 2 months, I wish I had worked harder at saving money for this. I had no clue how very expensive college is today. These words hit so close to my heart- our thoughts are in line with yours. We sunk a LOT of money into our daughter’s freshman year at a private “Christian” college where my husband and I attended- we could have paid for half of her education at a local university with that money! She did end up coming home and commuting to the local university, but now has loans coming due- part of me wants to “bail her out” and use our savings to spare her all the interest, but my husband wisely feels this is part of her growing up and being responsible for her own degree! Our second child is half way through college and our “baby” will follow her brother in 2 years to college. These waters are tough emotionally, relationally and financially! But, we are savoring all of the little gifts when we all 5 are together! Thanks for the encouragement! Great give-away! Expecting my 1st grandchild so would put this towards his/her college fund. Great give-away!! We are in the midst of planning for 2016….college is very costly!! We have been blessed by a great aunt who started 529 plans for 2 out of our 3 kids and now we just keep putting in birthday/Christmas/gift money from family to their accounts. Our oldest is just starting Kindergarten this coming Fall so hopefully in 12 years, we’ll have saved a good amount for him as well as his 2 younger sisters. We haven’t done much to save. But need to become much more proactive. A bank that gives back is a nice change. We’ve sold two vehicles and are finally getting my husband’s employer to pay for his office rent. BIG money to go toward the monthly payment for tuition. Son is working this summer for his spending money. HARD physical labor!! Thank you so much for the insightful advice!! 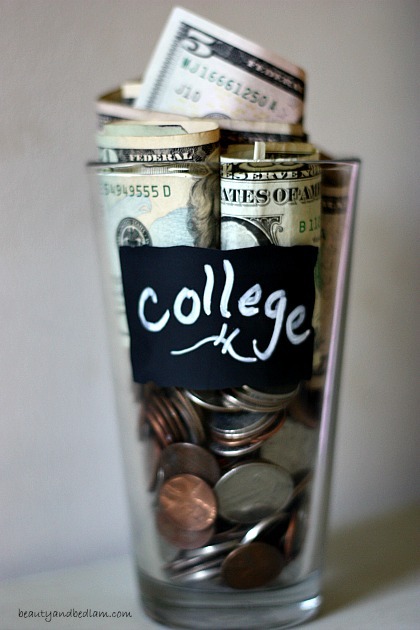 We’re saving slowly for our three sons to have money available for college. We have a rental property and the income for that is saved every month…..here’s hoping they pick state schools and get scholarships!! We have young children and are in the prime time to begin saving. Thanks so much this reminder! Every dollar counts! I love the idea of letting kids know they need to pay half of their tuition. It makes them think about and work for it a little harder. Thanks for sharing about ECCU, never heard of them! Thanks for the tips! I’ll check out ECCU. College expenses are frightening! Every dollar DOES count. We too went through some difficult times during the recession and didn’t save enough for college. My son is going this Fall and my husband and I are a little nervous about tuition. My son is going to a school that sets up paid Co-ops in his program starting sophmore year so that should help. I learned that every dollar saved counts and it’s never too late to start saving for college. These are great ideas! With four kids, the oldest graduating from high school in two years, paying for college is an almost daily topic of conversation in our house. It is daunting for sure! I appreciate these suggestions and ideas! We do the way2save savings account through Wells Fargo as well and it is amazing how quickly that adds up. Celina – thank you so much for sharing your story. I love getting glimpses into what everyone else does.